A few months ago, I came across a recipe by Alice O'Dea for chocolate cake for one person. (Click here to go to the article with the recipe.) It sounded like a great idea, so I saved the article. I already have a wonderful recipe for chocolate cake, but that recipe takes a lot of time and ingredients and makes a lot of cake--even if I half the recipe (which I usually do now) it's still a lot of dessert unless you have a big group of people. And dessert is good, so you never want to feel overwhelmed by it or unable to finish the sheer amount of it. And of course I am all for moderation. I don't find it at all necessary to try and cut out sugar; when I want something sweet, I eat something sweet. But I don't eat sweet things all day long, and I definitely try and keep processed foods to a minimum. "Processed" is the key word there, isn't it? You can, of course, go to the store and buy cakes and desserts that are small. Grocery stores sell single slices of cake, and you can always buy a box of Hostess or something so that you can keep the box for months and only eat one serving at a time. But if you can make a single serving dessert at home isn't that better? That means less processed and more control over ingredients. And honestly, it's fresher and nicer. That being said, it took me quite a while to finally try out this recipe. I finally made it to celebrate the 10th Anniversary of one of my favorite shows, Primeval, so that I could take this ridiculous picture. I wanted the characters to get their own cake to celebrate. So now I can come and describe my experience with this recipe. It's very simple to make, much quicker than making a full cake. Not only are you using less of each ingredients, you're also using less ingredients. By habit, I mixed the dry ingredients in one bowl and the wet ingredients in another bowl and then mixed them together, but I think you can just stick to one bowl (after you've mixed the dry by themselves, of course) in this case. 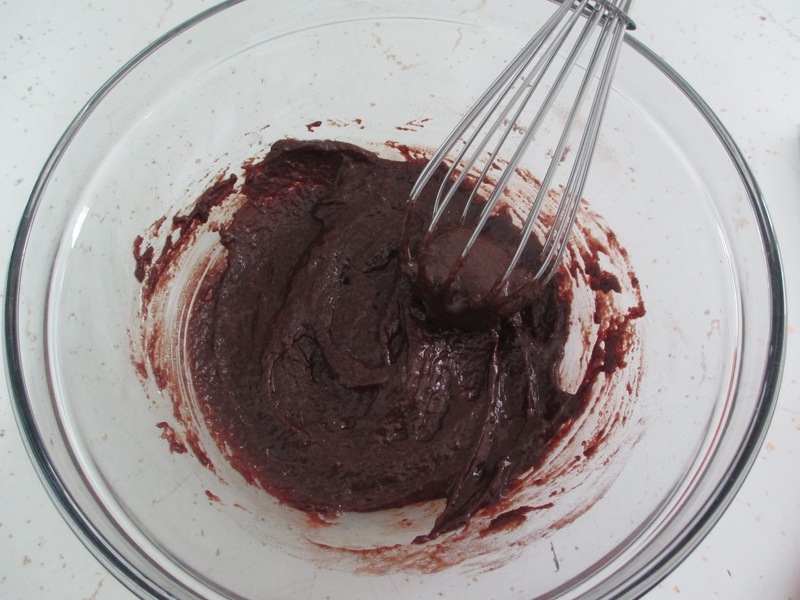 I felt very silly mixing such a minimal amount of batter, as if I were playing rather than truly baking something. I mostly followed Alice's recipe. I did use Dutch-process cocoa powder--which she didn't expressly say not to do but I know some recipes say not to use it. It worked fine for this recipe. I also used regular sunflower oil instead of coconut oil because I don't have any coconut oil at home right now and because I wouldn't want to taste the flavor of coconut in the cake (and because I imagine she specified coconut oil because it's healthier than canola oil, but sunflower oil is also better than canola oil--which is why I always use it instead of canola oil). I unfortunately haven't bought more measuring spoons yet, so I had to measure 1/8 teaspoons of some of the ingredients with a regular teaspoon; my measurements on those probably weren't perfect, though I tried my hardest. Oh, yes, and I didn't add chocolate chips, mostly because I don't see the point (it's a cake not a brownie). Alice used a toaster oven, but I have a pretty small oven so I didn't feel bad heating it for just a tiny cake. She cooked her cake for a total of 20 minutes; mine was done in 15 and could possibly have gone one minute less. So do check on your cake. I used a small glass storage container to bake the cake in. At about four inches in diameter, this meant that the cake was only about a quarter inch thick. So if you have a container that's just a little smaller, that might work better. Then again, you probably don't want the batter too thick because there are no eggs to help make it fluffy; so you don't want it to end up too dense. My cake wasn't dense. It probably was less fluffy than the usual cake, but it is thinner, too. So there was enough air in there to make it feel normal. It tastes normal, too. No, not as good as that other cake recipe that I said I use. This one tastes much more standard than that. Remember that, as always, it'll take on the flavor of the cocoa powder you use, so whatever you do don't use Hershey's or Nestle; try to get something from a store like Whole Foods or even Tuesday Morning instead. I used Guittard cocoa powder, which you can get at World Market. It gave the cake a mildly rich flavor. And it really did taste quite nice; I found myself craving more later in the day. Because I may not have done my 1/8 teaspoon measurements accurately, I did worry that I added too much vinegar or baking soda (I intentionally let myself measure extra vanilla). I kept wondering if there was a slightly sour taste, or if I was getting a slight bitter aftertaste. Still, this was a small enough question that I'm going to ignore it, and I imagine that if it was there it was due to my measurements. As you can tell, ultimately I'm spending a whole post talking about someone else's recipe because I do find this concept exciting. In her article, she talks about the multitude of single serving cake recipes that are out there, but this is the first one that I've come across. I'm very taken with it, and it worked well for me. I would love to find more recipes like this for other desserts. This is the type of thing that you can make once a week to treat yourself, an everyday type of recipe that you use so often that you end up memorizing it. Don't say no to dessert; learn how and in what way you can say yes*. *Organic flour, organic sugar, non-GMO cocoa powder, aluminum-free baking powder, Himalayan salt, organic/unsweetened almond milk, cold-pressed sunflower oil, Madagascar Bourbon vanilla extract, and white vinegar. That isn't what the ingredients look like in grocery store cake. And note that if you also use a milk alternative, this recipe is vegan, mainly because it doesn't have eggs (not that I'm vegan, but many people are).